We’d love your help. 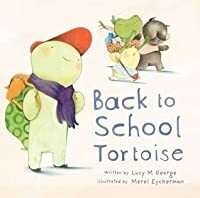 Let us know what’s wrong with this preview of Back to School Tortoise by Lucy M. George. It's time to go back to school. But Tortoise is worried. What if he falls down? What if he doesn't like lunch? What if the kids are mean to him? What if he falls down, doesn't like lunch, and the kids are mean to him? The perfect back-to-school book about being brave, with a surprise at the end! To ask other readers questions about Back to School Tortoise, please sign up. really cute book about first day of school jitters. loved the ending. Sweet Back-to-School Book... with a heartwarming twist! An absolutely delightful picture book with gloriously humorous lessons about being brave and doing the things you are afraid to do with confidence. The illustrations do a wonderful job of expressing the emotion of the characters, which cannot be found in the simple and short language of the text. And the cute twist ending is enough to make you clutch the book to your chest as you are overcome with giggles and smiles! A must-read, especially for teachers and educators. Read this PB about 5 times today because I can't get over it. So much adorable. Great picture book with a surprising twist at the end! Picture books with messages of getting ready to go back to school, an event dreaded by most children, abound. Yet, this story has a unique twist. Tortoise is not your average animal getting ready to go back to school. The reader follows along as he says walks along to school, imagining all the ways his first day can go awry. But, “as bravely as he could” Tortoise decides to open the door into the classroom. Beyond delightful, this story provides a fresh new look on an old routine. Painted in ear Picture books with messages of getting ready to go back to school, an event dreaded by most children, abound. Yet, this story has a unique twist. Tortoise is not your average animal getting ready to go back to school. The reader follows along as he says walks along to school, imagining all the ways his first day can go awry. But, “as bravely as he could” Tortoise decides to open the door into the classroom. Beyond delightful, this story provides a fresh new look on an old routine. Painted in earthy and neutral tones, the nature settings and even the classroom fade into a quiet background. Tortoise and the other animals at school are painted in slightly bolder colors but all are unthreatening. The graphics really allow the message that school can seem scary to anyone take center stage. They also do not give anything away about the twist on Tortoise’s school day. The large, round pictures and bold, exaggerated, and simple words would make this a perfect storytime book, especially for preschool classes on their first day. Highly recommended for public libraries and elementary school libraries. (spoiler alerts) I dunno, I am all about eroding the dichotomy between teachers and students, but the twist at the end of my book left me and the children going wtf? It didn't fit a child's world view it was an adult joke essentially but neither written in an adult nor an accessible to the child sort of a way. The protagonist is referred to as "he" and doesn't have a name (not even Tortoise) which makes the books seem sort of rushed and half thought-out. My little critical literacy experts were (spoiler alerts) I dunno, I am all about eroding the dichotomy between teachers and students, but the twist at the end of my book left me and the children going wtf? It didn't fit a child's world view it was an adult joke essentially but neither written in an adult nor an accessible to the child sort of a way. The protagonist is referred to as "he" and doesn't have a name (not even Tortoise) which makes the books seem sort of rushed and half thought-out. Then he left for school. Or he didn’t like lunch? When summer ends, Tortoise is nervous about going back to school. He hesitates, and runs through all the "what-ifs" in his mind. Finally gaining his courage, he steps into the classroom and heads to the front-he is the teacher! PreK-Grade 2. Curriculum Connection: This would be a great book for those first days back to school with little ones, to discuss that everyone has anxiety and fears about new situations,not just children. 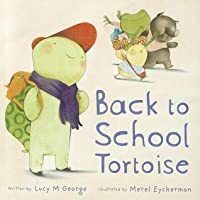 It offers reassurance that even their teacher is nervous on the firs When summer ends, Tortoise is nervous about going back to school. He hesitates, and runs through all the "what-ifs" in his mind. Finally gaining his courage, he steps into the classroom and heads to the front-he is the teacher! PreK-Grade 2. 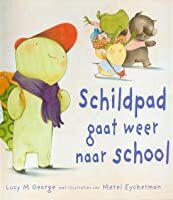 Curriculum Connection: This would be a great book for those first days back to school with little ones, to discuss that everyone has anxiety and fears about new situations,not just children. It offers reassurance that even their teacher is nervous on the first day back! Citation: George, L. (2011). Back to school tortoise. Park Ridge, IL: Albert Whitman and Company. Loved it, loved it, loved it. The illustrations are just wonderful - I love the colours (that gorgeous green) and the white spaces and big lettering and the way we're led through the story. Tortoise's mug is just adorable. And the story of his fears is relevant to kids of all ages. There are many picture books about being scared to go to school - this one was especially charming for me. And the ending, well, I was loving this book before the awesome ending but after that final page I was truly s Loved it, loved it, loved it. The illustrations are just wonderful - I love the colours (that gorgeous green) and the white spaces and big lettering and the way we're led through the story. Tortoise's mug is just adorable. And the story of his fears is relevant to kids of all ages. There are many picture books about being scared to go to school - this one was especially charming for me. Read this with my 4 year old son. 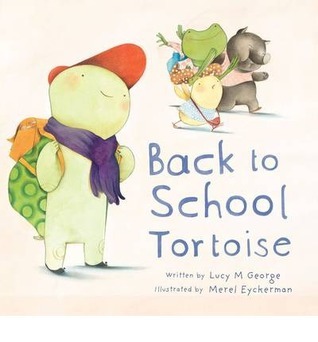 The story follows Tortoise as he gets ready to go back to school after the Summer holidays. However he has mixed feelings about it all. What if the others don't like him, what if he trips and falls over but what if he really enjoys it and makes some good friends. Will Tortoise be brave enough to go to school? We both enjoyed it and my son did understand the twist at the end of the story and thought it was hilarious! The cute ending on this pushed it up to a four for me. On his first day back at school, Tortoise worries. What if he trips? What if he doesn't like lunch? But then he also "what ifs" good things, too, like his favorite lunch and making new friends. He decides he can go through with the first day despite his fears, and the cute twist at the end will charm little ones. Just as it says in the title, I think this book would be great to read when the children come back to school. Some of the characters in the book are not excited to go back to school, but int he end they all are happy to be back and excited to learn which I think is a great way to start the year off. The illustrations are also fun for the kids and have fun animal characters. "Back to School Tortoise" is a back to school book that emphasizes the bravery involved in meeting and making new friends. This book says what many kids feel at the beginning of school. The illustrations show the different emotions that go into the first day of school. This story would also be a good "quick check" book to see which students pick up on the twist at the end. Tortoise gets up and prepares for school with "what if's" in this head...both positive and negative. As he enters the classroom, children will giggle with surprise and delight to find what role he plays in the group. If you need a gift for a teacher, especially a new graduate or a teacher launching his or her career in September, this is an adorable gift! Trust me!! The ending literally made me laugh out loud!!! love the illustrations and the surprise ending! I know a bunch of teachers who will want this book next August. Too short however, it needs to be longer to get 5 stars. Aww, this one does a nice job of addressing back-to-school fears in a simple, heartwarming way. Get ready to "Squee!" This book is absolutely adorable. Cute twist at the end. Cute and simple. Very basic, but not bad for tackling the beginning school jitters. Another cute read aloud for back-to-school with a fun twist. Perfect for a child nervous about starting preschool or kindergarten. I love the adorable animal characters. This is a sweet story with a funny little twist.